Desert blues band Songhoy Blues formed when three of its members – then strangers – fled south to Bamako with the ambition of keeping the spirit of northern Mali alive. Locating a drummer, they performed protest songs to ecstatic crowds before attracting international attention via Damon Albarn’s Africa Express project. They’ve since recorded a debut album with the Yeah Yeah Yeahs’ Nick Zinner, played Royal Albert Hall, and feature heavily in a new film about Malian musicians who refused to be silenced. Filmmaker Johanna Schwartz’s They Will Have to Kill Us First is essential viewing for comprehending the power of music – as a political tool, as a form of communication, and as a basic human right. 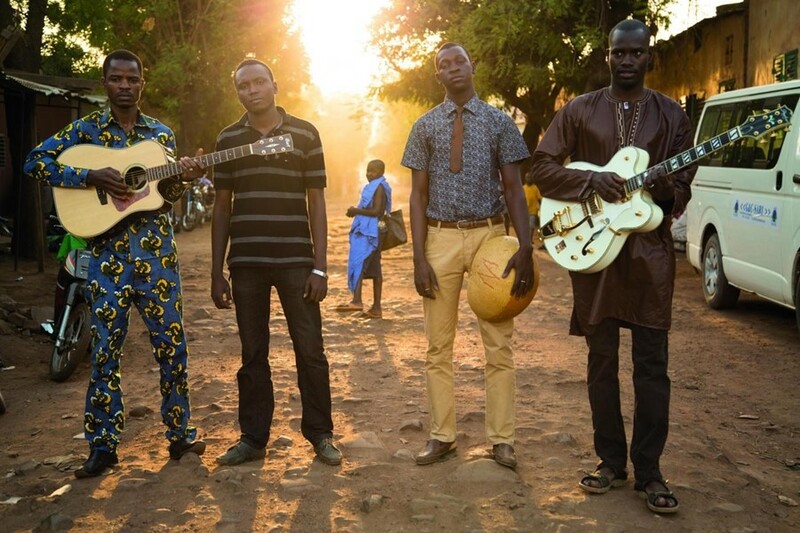 We spoke to Aliou Touré, the lead vocalist of Songhoy Blues, about being a singer in exile. How did the jihadists try to justify the outlawing of music? Aliou Touré: Those guys, the jihadists, they use Islam and the Muslim religion as a pretext to ban music. They try to enforce sharia law in places that are already modern: north of Mali, Timbuktu or Gao, they’ve been Muslim for centuries. In fact, they don’t need anybody to teach them about Muslim or Islam religion. It’s just a pretext. They banned every radio station, every bar, every club. If you had a phone or were suspected of listening to music or watching any movies, you would be in trouble. They were against it all. You point out in the film that the north is cut off – there’s no official road between Timbuktu and Kidal. Is music another road that connects cities and cultures? Aliou Touré: At the moment, culture is the only thing that links us all together. Yes, the problem is that effectively there aren’t any roads, and the government isn’t acting on it. That’s why it’s a mess at the moment. The next step is for those in charge of the country to establish links between the cities. It really needs to be improved. What else should viewers take away from the film? Aliou Touré: Infrastructure is very important, but an important lesson people can pick up from the film is the diversity of characters that are featured. In the film, you’ve got Touareg people; you’ve got Songhay people; you’ve got people from the south; you’ve got people from the north. In Mali, what’s important is to show that diversity, but to unify people – to respect every diversity. Have you been able to show the film in Mali yet? Aliou Touré: No, it hasn’t screened in Mali yet, so most of the people there haven’t seen the film. But it’s getting good vibrations, a good spiritual sense from that direction. We’re not scared. We’re not scared at all, but it could become dangerous. We’re not expecting repercussions, but we know it’s a possibility. What’s the essence of music in Mali? Johanna called it the birthplace of blues and rock 'n’ roll. Aliou Touré: For Mali, music is essential. It’s a country that’s especially dedicated to music – to play music for people. It’s real people who play for real people. That’s something I’ve never seen anywhere else before. That doesn't exist outside of Mali. Were you familiar with the Yeah Yeah Yeahs or Blur before working with Nick Zinner, Damon Albarn and Brian Eno? Aliou Touré: Before Africa Express, we’d never heard of them before. So was it like, “Hi, my name is Damon Albarn and I’m from a band called Blur”? Aliou Touré: Ah, Damon was really modest. He was just happy and like anyone else you’d meet in the street. But when we had the chance to come to the UK, it occurred to us how he was actually a really big star. It’s really surreal seeing you move from Bamako to Camden Town. I was very taken with the film’s cause and it made me want to do something, but I’m not sure what. Aliou Touré: You’re welcome to do anything, but it all depends on your motivation levels and if you’re actually in a position to help. The positive thing is to raise awareness for people – to make the world more conscious about what’s happening around the planet, especially in Mali. Aliou Touré: A world without music is a body without a soul.